In honor of Presidents Day this week, I am going to talk about Presidential Quotes. Great quotes from great Presidents of the United States. I’ll start with President John F. Kennedy. President Kennedy as assassinated when I was 5 years old. We lived in Connecticut then. I vaguely remember going down to the railroad station and watching the train go by with his casket. We all like conformity. Today we talk about stepping out of our comfort zone. 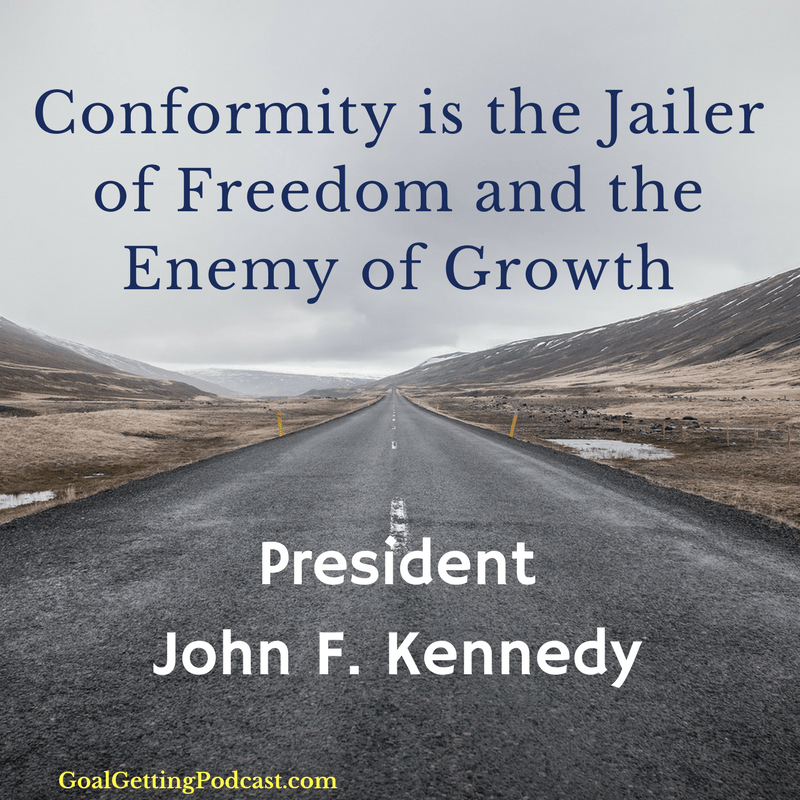 The knowledge that conformity is the jailer of freedom and the enemy of growth is not knew. JFK believed we needed to step out of our comfort zones. He took several when he was President. We went to the the moon, he changed politics and he took other risks. As a leader, we have to take a few risks to grow. If we don’t we won’t change. Anytime you take risks you will change. Without change there is no growth. Don’t let conformity keep you lock in your current world. It is like a jailer. If you don’t take risks because what you are doing is comfortable, easy, status quo, you will not be happy later in life. Doing what we want is freedom. Freedom to choose, freedom of thought. I’d love to see you step up and break the chains of conformity and be the person you want to be. Be Free, Take Risks! How are your goals coming this year? Are you having problems already keeping up with tasks you need to accomplish? Do you need an accountability partner or someone to walk with you and help you keep on track. Check out my coaching page. I have a plan that can help you. I’ll help keep you on track as we work together to accomplish your dreams.